The Kruger and its associated HUD icon on the PC/console versions of GTA Vice City. The Kruger (or Ruger in the original PS2 version) is the entry-level assault rifle in Grand Theft Auto: Vice City. As an assault rifle, the Kruger can manually aim in first-person view but cannot normally automatically aim at characters. Its performance is similar to that of the more expensive M4, the main difference is its significantly slower rate of fire and slightly lower amount of damage (35 vs the M4's 40). The weapon is based on the real life Ruger Mini-14 with a government legal barrel and a folding stock. 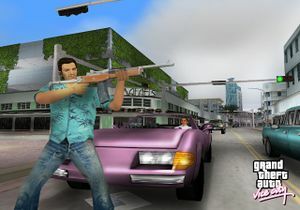 Tommy using a Ruger in GTA Vice City. Vice Point - On top of the rear ground floor roof of the El Swanko Casa. Ocean Beach - Available for purchase at Ammu-Nation for $1,000 after completion of "Guardian Angels." In the higher levels of the Vigilante missions, criminals can use the Kruger against the player. The Kruger can be obtained by inputting the cheat for the basic weapons set. 120 ammo will be given to the player. The Kruger can auto-aim by having the player character be set on fire. This glitch can also work with the M4. It is best used after completion of the Firefighter side-mission to gain fire-proofing of Tommy. On the iOS and Android versions of GTA Vice City, the Kruger, M4, and M60 can already auto-aim even without the player character being on fire. This page was last modified on 28 November 2014, at 22:59.